The Agate Beach Golf Course opened for play in 1931. The signature hole, par 3 number eight, installation of an irrigation system, driving range, tee boxes and a new clubhouse were built in the 60’s. The course layout is fairly level with a slightly rolling terrain surrounded by a lush wooded area. It is well maintained throughout the year and is especially suited for year round play.Through the years golfers have enjoyed the course with friends and family making it a family tradition. It continues to be our commitment to provide an enjoyable round of golf. 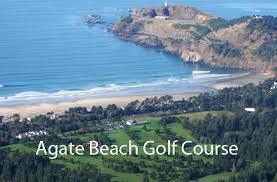 Enjoy the “game of a lifetime” at Agate Beach Golf Course.